For years, relatively few people knew or cared that Kia was selling a mid-size sedan to compete with the Toyota Camry, Honda Accord and Ford Fusion. But that's about to change. The new-for-2011 Optima, featured in a multi-million dollar Super Bowl ad, is handsome and well-powered and longer and wider than its predecessor. It even has better fuel mileage ratings than the non-hybrid versions of Camry, Accord and Fusion. And the starting retail price for the 2011 Optima undercuts the major competition while, in some cases, including more standard equipment. The Optima also comes standard with longer basic and powertrain warranty coverage - up to 10 years/100,000 miles, whichever comes first - than competitors offer. Starting manufacturer's suggested retail price, including destination charge, is $19,690 for a base, 2011 Optima LX with 200-horsepower, four-cylinder engine and manual transmission. The lowest starting price for a 2011 Optima with automatic and the same 200-horse, direct-injected four cylinder is $21,190. Prices go up to $25,190 for an Optima EX with 274-horsepower, turbocharged four cylinder. 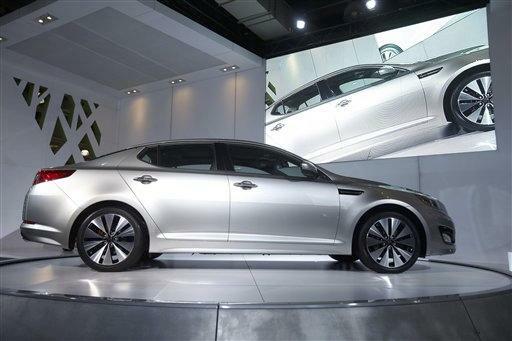 A gas-electric hybrid Optima is slated for later this year. Mid-size competitors include the 2011 Toyota Camry, which starts at $20,580 with 169-horsepower, four-cylinder engine and manual transmission, and the 2011 Ford Fusion, which also starts at $20,580. The base Fusion has a 175-horsepower, four-cylinder engine and manual transmission. There's also the Optima's sibling, the 2011 Hyundai Sonata, which has a starting retail price of $19,915 with 198-horsepower four-cylinder engine and manual transmission. The Sonata, built by the same company that owns Kia, shares its underlying platform and engines with the Optima and offers the same warranty coverage. But where the Sonata's exterior styling is akin to a rich, luxury car, the Optima's outer appearance tends more toward the sporty side, with blacked-out grille, sleek roofline and solid proportions. In fact, few people would guess the nearly 16-foot-long Optima comes only with a four-cylinder engine under the hood. These new engines for 2011 help provide fuel mileage ratings that are second-best in the class of non-hybrid family sedans. Specifically, the U.S. Environmental Protection Agency fuel economy rating for the 2011 Optima with base engine is 24 miles per gallon in city driving and 34 or 35 mpg on the highway, depending on whether the transmission is manual or automatic. Among non-gas-electric hybrid sedans, the Optima's ratings are surpassed in the EPA's family sedan segment only by the 2011 Hyundai Elantra that's rated at 29/40 mpg. Especially impressive for the Optima is that the base engine, likely to be in the majority of Optimas sold, is a 2.4-liter, double overhead cam, gasoline direct-injection four cylinder that generates more horsepower and torque than the major competitors. Horsepower tops out at 200 in the Optima, while peak torque is 186 foot-pounds at 4,250 rpm. This compares with 167 foot-pound of torque at 4,100 rpm in the 169-horsepower Camry and 172 foot-pounds at 4,500 rpm in the 175-horse Fusion. The test Optima was a mid-range EX with the base engine, and not one passenger suspected, based on ride and power, that it was just a four cylinder. The six-speed automatic delivered power smoothly to the engine, and the four-door car responded quickly to accelerator pedal commands to speed up and merge. I didn't drive to maximize miles per gallon, though, so mileage suffered and was near 24 mpg after 70 percent city driving. The uplevel engine for the Optima also is a four cylinder - a two-liter, double overhead cam, turbocharged powerplant capable of 274 horsepower and 269 foot-pounds of torque coming on as low as 1,750 rpm. This engine replaces last year's 194-horsepower V-6. As expected, fuel mileage is lower for a turbo Optima: 22/34 mpg. The Optima is especially comfortable in straight, flat-out highway driving. The suspension seemed a bit undecided about what to do at times when pushed to take a "set" while traveling around curves at speed. The new Optima does not offer a luxuriously refined ride. I heard some road noise on rough pavement and felt some road bumps. The radio, however, emitted strong, crystal clear sounds, thanks to the addition of the optional technology package with Infinity premium audio. Note that Sirius satellite radio is standard on all Optimas, with three months of complimentary service. This, plus the Optima's standard Bluetooth cell phone connectivity, is not found in all Accords and Camry sedans. The test Optima's interior was comfortable and nicely appointed, with the optional navigation system display screen large and colorful in the top middle of the dashboard and angled a bit toward the driver. Buttons and knobs had good feel, and plastics and other materials had a quality look. Seats were firmer than expected but were comfortable. Back seat room legroom, though, lags many competitors at 34.7 inches. In comparison, the Camry's back seat offers 38.3 inches, while the Fusion's back seat has 37.1 inches. But the Optima's 15.4 cubic feet of trunk space - versus 15 cubic feet in most Camrys - is accommodating, even if it doesn't match the 16.5 cubic feet at the back of the Fusion. All safety equipment is standard on the new Optima; this includes curtain air bags, antilock brakes, electronic stability control and even electronic hill start assist control, which helps keep the car from rolling back when a driver lifts off the brake pedal while on a steep hill.